A major concern in water and wastewater treatment processes is identifying the most effective and efficient way to remove solid particles and other materials found in the liquid stream. The most effective method of eliminating unwanted contaminants is through the use of polymers in a sludge-creating process. Polymers are used to coagulate suspended solids and produce large curds of solid materials (floc) which are more easily removed from the water treatment stream. Polymers are available in a variety of forms and concentrations and are supplied as either dry powders or concentrated liquids. Each variation presents unique challenges when sizing mixers. Polymers supplied in powder form must be wetted out which is generally done by an automatic dry polymer dilution (eductor) system. The resulting polymer solution needs to be blended in a mixing tank and occasionally “aged” in a conditioning tank. Emulsion Polymer – An emulsion product allows the manufacturer to provide concentrated liquid polymer formulations that are not in a water solution form. Generally it is an oil emulsion. Emulsion polymers must be diluted before use and this dilution is done by automatic polymer feed systems. Solution Polymer – Polymers supplied in this form are easier to dilute, handle and feed than the emulsion and dry polymers. They may be diluted prior to use or fed neat from the shipping bin. These variations in polymer characteristics are important to understand when configuring a mixer for optimal mixing. Efficiency of the sludge-creating process, and therefore optimization of the mixer, rely heavily on the type of polymer that requires activation. Emulsion polymers have their own unique mixing requirement. As these polymers are part of an emulsion and are not true solutions, they separate during prolonged storage time. Therefore, emulsions must be periodically mixed to maintain uniformity. The type of mixer selected for this stage will depend on the size of the tank that the emulsion polymer is stored in. All types of polymers need to be mixed during the activation stage. However, once a polymer is made-down and activated, it is very shear sensitive, so the mixer needs to be of a low-speed, low-shear design to minimize the degradation of the polymer. High Gear Reduction Ratios: Dynamix offers gear-reduction ratios beyond the standard 300 to 400 rpm output for portable mixers to minimize the polymer shearing. Our output speeds also include 159 & 83 rpms as standard. Engineering: Dynamix application engineers review each application and check the impeller tip speeds to ensure that the polymer mixer meets your requirements. 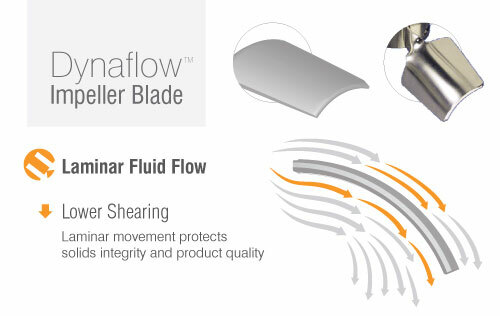 Impeller Design: The Dynamix Dynaflow™ impeller is designed to minimize shear behind the impeller blade and promote good mixing/pumping while keeping the shear level to a minimum. All of Dynamix’s mixers can be configured to meet your application requirements. For more information on all Dynamix mixer lines, visit our Product page. Portable: Dynamic quick-coupling allows the mixer to be moved from tote to tote by a single person. Seals the Tote: Neat emulsion polymer must be protected from water contamination, so areas of high humidity are of specific concern. The ITM tote polymer mixer completely encloses the tote, thus removing the possibility of any contamination. Collapsible Impellers: The large collapsible Dynaflow™ impellers allow for low-shear mixing. Due to our wealth of experience in water treatment processes, Dynamix’s application engineers will work with you to size up the best polymer mixer for your application no matter what your tank size is. If you’re interested in learning more about mixing solutions for polymers, post a comment or email us at [email protected]. recognize so that I may subscribe. Thanks. You can find the sign up form for our newsletter at the bottom the home page. I really like all of your article here. And If what you write here is true, I will be very happy to reblog this again and share it to all of my friend.